Here's a really cute gift for a new mom on her first Mother's Day from her daughter or son. Perfect gift idea from the daddy or from grandparents. Poem is written as if the baby is speaking to the mom and it is written in a kid-like type. She'll love to have this keepsake! Hey Daddy! Don't forget to get a special keepsake for Mommy to commemorate her first Mother's Day with your daughter or son. 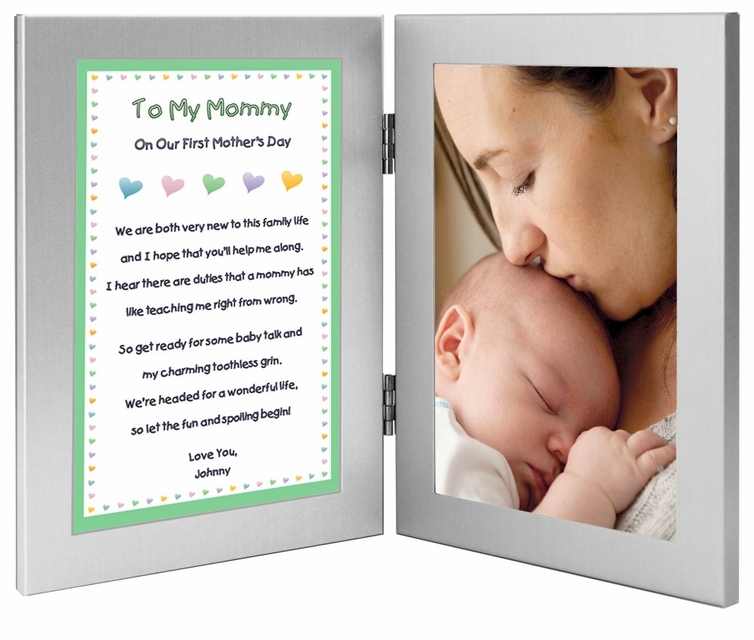 Cute poem in the left frame and the right attached frame will hold a 4x6 inch photo of the baby when inserted after delivery. and I hope that you'll help me along. like teaching me right from wrong. and we hope that you'll help us along. like teaching us right from wrong.